Originally published by The Connectivist. At an art fair recently, my friend Rose fell in love with a robot. The installation in question was a tall, dark mash of technological parts. It bore a loudspeaker for a head, its eyes formed out of the speaker cones. It beckoned us with arms built from skinny windshield wipers. The abdomen was a slim podium that had a CD player attached to form the robot’s chest. Rose has since christened the creation “Schubert,” finding herself endeared to it by the way it appeared to interact with her, and how it seemed to fix her in its wide-eyed gaze. Her attraction to that robot—however superfluous—taps into an age-long relationship between humans and automatons. For centuries, we’ve been shaping technology into something that makes us feel something, infusing our creations with aesthetic qualities that build up their “personality.” The purpose and impact of this endeavor? That’s something that has tickled psychologists for years. A karakuri displayed at the British Museum in London. Stories of automatons have been pervasive since Grecian times, in mythologies that described armies of robot-like servants. Then came one ancient Greek engineer named Ctesibius who built water-powered clocks, decorated with little figurines in the shape of people, birds, and bells that seemed to move around unaided. In 1495, Leonardo da Vinci penned the plan for a mechanical knight—though he appears to have never actually built this moving giant. 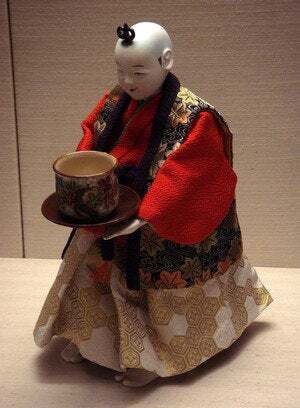 And in the 17th and 18th Centuries, the Japanese became renowned for their karakuri—courteous, exquisitely decorated dolls that were mechanized by a system of pulleys and weights to perform tricks independently, like serving tea, or writing letters for show. Why do we like to see ourselves mirrored in the things that we invent? That’s merely a smattering, but it proves that robots, defined loosely as autonomous machines, are well steeped in history. “Hundreds of years ago, mechanical toys—before the invention of the word ‘robot’ itself—elicited the same emotion of excitement and wonder from the audience, as the modern robot,” says Alexander Libin, a psychosocial scientist and scientific director of Simulation Education Research at the MedStar Health Research Institute. And therein lies the divide. Today we build purely functional automatons, designed for military work, industrial service, or research tasks; and then there’s the murkier set we create, the social robots that we’re still trying to figure out. They leave a trail of entertainment in their wake, but increasingly we use social bots to enrich other aspects of our lives. These are the robots we fit with all the trappings of humanity—they tend to look more human, sound more like us, and behave like people do. Take C-3PO, the beloved, bumbling robot from the Star Wars films of yesteryear. Other creations are not human necessarily, but are built to be recognizable as animals, for instance—like the cat designed as a pet companion, or an endearing dinosaur robot built to test people’s sense of empathy toward machines. Emotional worrywart C-3PO is easy for humans to relate to. It’s this “social robot” group that psychologists find intriguing, because through their interactive role with us—as entertainers, educators, assisters, and companions—these specimens provide a way of measuring human behavior. But why do like to see ourselves mirrored in the things that we invent? That question has spawned a whole division of research called robopsychology, which Libin and his research partner and wife, Elena Libin, see as the study of compatibility between humans and artificial creatures. Roombas have even been lovingly depicted on several acclaimed shows. “People personalize their machines,” says Steve Whittaker, a cognitive psychologist at the University of California Santa Cruz. “You could see that as a way of developing a relationship or trying to define themselves through their machine”—not unlike the way a teenager creates a self-expressive haven out of his or her room. He taps into the idea that people simply enjoy this process; we like to draw inferences about the potential “personalities” or “characters” that these machines could have in an imaginary world. Roombas—diminutive, self-navigating vacuum cleaners that scoot around the house—are a good example, and people take great joy in decorating theirs, Whittaker says. 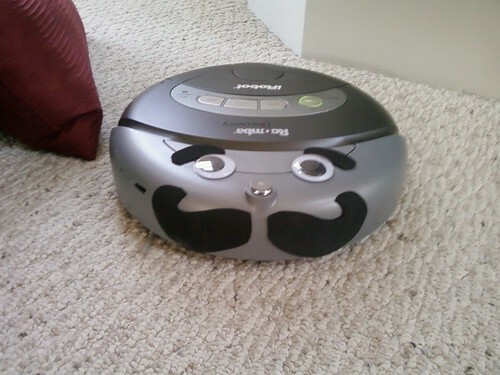 Semi-humanized Roombas have even been lovingly depicted on several acclaimed shows. “Building robots as humans is very tempting,” says Libin. “We are looking for ourselves in the hand-made creations, trying to understand our own nature by observing it in others.” The motivation to watch something we recognize is strong, and it allows us to be fascinated with our own qualities. Rose, recalling her run-in with the charming art fair bot, describes it this way: “It’s almost like the human brain wants to see other human-like or engaging qualities, before seeing the basic elements that things consists of.” The fact that the robot moved, and gave a sense that it might even speak, only solidified its personality for her. “Precious Schubert,” she quips. There might also be an aspect of control too. “Modeling our behaviors, emotions, and thought processes in robots also helps us to get a glimpse of the mechanisms that govern our own lives,” Libin says. If a robot waved at you, would you wave back? Two researchers, Reeves and Nass, found that humans dealing with computers relate to the technology in the same way as they do other people. But trying to tweeze out the extent to which we might feel empathy with robots, or even deep companionship perhaps, is still a challenge. Attachment, empathy, sensation seeking, and engagement are the many varied qualities in humans that shape our relationships with robots, Libin says. Robots contribute to that relationship through their independence and emotionally interactive designs. Unsurprisingly, facing all these variables our attitudes are hardly uniform: “Our response to robots depends not only on how [good] the design is, or how interactive the robot is, but also originates in our personal histories,” Libin explains. Bad experiences with technology, or the kinds of cultures we come from, can shape the way we feel about automatons. But despite all these musings over our social connections with robots one thing is clear. Gone are the days when an entertaining, tea-toting robot would suffice. At this point in history, the functionality and social aesthetic of robots appear to be increasingly entwined. We now have the friendly-looking humanoid robot prototypes that help carry wheelchair-bound patients from chair to bed. Robots that care for the elderly are also in the lineup. And witness the efforts of neuroscientist David Putrino, a postdoctoral research fellow at NYU who is studying how aesthetics in robotic limbs might alter the way that people use prosthetics.